That's right. If there's even a small potential for power generation through wind milling, w should go for it. It's one of the cleanest source of energy available, apart from solar cell and hydro-electric generator. 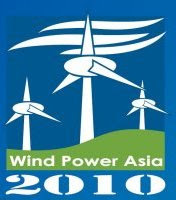 This year's Wind Power Asia (WPA) seminar was in Beijing, China, visited by a total of 15,065 visitors calling from 43 countries worldwide with some 445 exhibitors featured at the trade fair. Number of exhibiting companies has doubled compared to 2008. I really hope this is a sign of not just awareness of the general public about going green, but also commitment from all industry players in looking for cleaner energy solution. Travelling to China is not that expensive anymore nowadays with Air Asia flying direct from KLIA. Next year's similar seminar/conference would be in June 2010, it would be very interesting to find out what's in store this year. Given the time and means, I would very much love to visit such event. For now, the nearest thing to look up to is the Low Energy Office initiative undertaken by SESB Kota Kinabalu. I understand that there are still a lot need to be done on the installation of solar panels at their Tanjung Aru show unit. Time to make a visit. A. Coal plant (such as the one proposed in Lahad Datu), RM500mil? B. Wind mills (such as the one mentioned for Pulau Banggi), or the ongoing Rural Solar project, RM1bil?? C. Possible tie-up of Hydro power gen from the controversial Kaiduan Dam project in Penampang, RM2.8bil? Take some time out and think about where our billions of ringgit should go to. I KNOW WHAT TO CHOOSE.